For detailed information about my professional experience, please check out my LinkedIn profile. Aiming to be the “Xbox live of mobile eSports”, the Skillz platform enables mobile game developers to easily create competitive multiplayer experiences in new or existing titles. Skillz handles user accounts, player matching, cross-platform gameplay fairness, anti-cheating, leaderboards, rankings, achievements, loyalty rewards, live tournaments, video streaming, replay recording and more. During my tenure at Skillz, I led the development of both the Android and iOS SDKs as Lead Engineer and then as Product Manager. With our self-published Diamond Strike game, we turned a dead title into one with thousands of DAU and $0.39 ARPDAU as of January 2016. AudioAB is a simple app to facilitate A/B testing of audio files on iOS. Perfect for auditioning mixes and masters on-the-go. A single playhead is shared for both tracks, so the user can instantly switch between hearing track A and hearing track B, without losing their place. I built this because I needed it for my own audio projects and decided to publish it in case others found it useful too. Machismo is an open source java library that parses Mach-O binaries and extracts useful information about them from their headers. Mach-O is the executable file format used by mach kernel systems, including Mac OS X and iOS. This library can be used to, for example, determine which CPU architectures a binary is compiled for. It can also be used to extract UUIDs for unique identification (useful for security applications). ImgGlyph for iOS is a collection of drop-in replacements for UILabel and UITextView that allow for font-sized in-line images (image glyphs) by auto-replacing specified strings with specified images with automatic sizing and positioning. 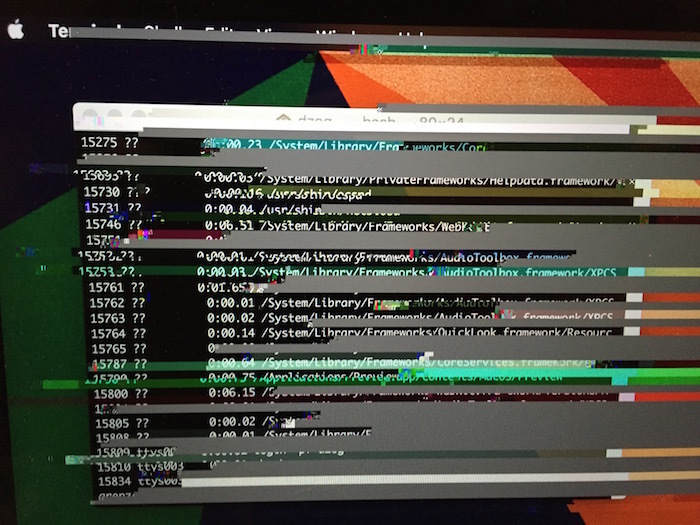 Artifact.saver is a Mac OS X screensaver that visually emulates serious hardware problems.